29 May 2015 | Conserving the greater sage-grouse is a complex endeavor. The bird’s range spans 11 US Western states covering both public and private land alike with some of the bird’s most prime habitat falling on property slated for energy development. Conserving such a species has led to a multitude of approaches aimed at preserving the bird’s rapidly declining population without stunting energy growth and development in the region. Several Western states have developed what’s called resource management plans (RMPs), creating high quality, science-based conservation in sagebrush ecosystems. Over the past four years, these plans have been submitted to the Department of Interior’s Bureau of Land Management (BLM), the nation’s largest land manager. And today, the BLM in partnership with the US Forest Service (USFS) rolled out their amendments of these plans which came from 10 western states. The finalized plans will serve as governing guides for sagebrush ecosystems that fall on BLM and USFS lands. The plans span a land mass the size of South Dakota; 50 million acres of sage-grouse habitat. “Conserving the greater sage-grouse must be done at a landscape-scale,” said Theo Stein of the US Fish and Wildlife Service (FWS). The plans address primary threats, such as habitat fragmentation and invasive species, facing the sage-grouse and sagebrush ecosystems. They focus on three approaches to alleviating these threats: minimizing new or additional surface disturbances, improving habitat condition and reducing the threat of rangeland fire. Included in these plans is a compensatory mitigation component which carries significant implications for conservation banking as well as other versions of market mechanisms for species conservation. Wayne White, the former president of the National Mitigation Banking Association, discussed the time the association spent with the BLM and other federal agencies on shaping a mitigation component of the plans. “We focused on high standards and equivalency throughout all forms of mitigation,” White said. The BLM will require and ensure mitigation that provides a net conservation gain to the species by avoiding, minimizing and compensating for unavoidable impacts from development, the document reads. “The RMPs require mitigation, which is a key piece of developing the market demand needed for conservation banking” Stein said. Conservation banks for the greater sage-grouse are already starting to appear. The Sweetwater River Conservancy Greater Sage-Grouse in Wyoming, marks the nation’s first. In Nevada, The Nature Conservancy and gold mining company, Barrick Gold, along with the BLM are collaborating on a bank . The Environmental Defense Fund’s (EDF) Eric Holst sees mitigation in this context as an endorsement of EDF’s market-based habitat exchanges. These exchanges allow development interests to offset their unavoidable impacts by purchasing mitigation credits. “By requiring mitigation on millions of acres of vital sagebrush habitat, these agencies are unlocking the vast untapped conservation potential of America’s working lands,” Holst, Senior Director of Working Lands, said in a statement. The plans now enter into a review process lasting over three months. 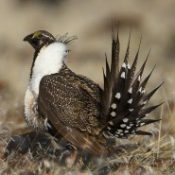 Outside the BLM’s announcement are ongoing legislative efforts impacting the grouse’s conservation. Late last year, Congress attached a rider onto the 2015 appropriations bill prohibiting FWS funding to be used toward proposing a listing status. There is also a defense policy bill that passed in the House earlier this month, which is attempting to curb sage-grouse conservation by arguing it would put military operations at risk. While last year’s rider didn’t prevent conservation initiatives from moving forward, Stein says the defense bill could allow governors to overturn these BLM plans.